All Weather Windows Edmonton corporate office hosted a celebration on Thursday, July 21, 2016 to honor the actions of four quick thinking All Weather Windows employees. 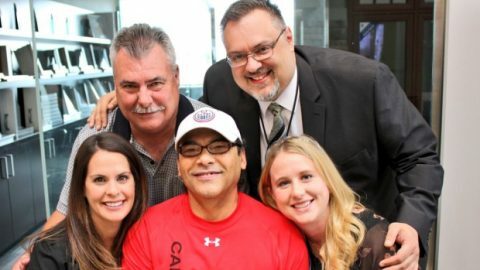 Alberta Health Services and Emergency Medical Services were in attendance to recognize the individuals credited with saving the life of fellow employee Manuel (Manny) Rodriguez using AED and CPR earlier this year. For more information on the event and story, please see the attached press release.